Students will examine the work of artist Barbara Kruger and consider how visual media, such as in print and advertising, can be constructed to influence viewers' perceptions and behaviors. Students will create their own works of art combining text and image to voice a perspective, as inspired by the work of Kruger. How would you describe Kruger's imagery? Why do you think the artist uses text alongside images? How does the text change or relate to the image it is paired with? How does visual media as seen in print and advertising influence perception and behavior? How can art be a vehicle for social critique? Artist Barbara Kruger worked as a layout editor at Condé Nast for 12 years, including posts at Mademoiselle, House and Garden, and Aperture. In 1969 Kruger began to make her own art while also writing poetry, film, and television reviews. A decade later she had developed her "picture pratice" with photographs repurposed from vintage manuals and magazines, which she had overlaid with her own texts or commonplace phrases. The completed works alter her found materials, placing her statements and questions over the images to rouse the viewer. Owing to her interest in the public arena and the everyday, Kruger's work has appeared on billboards, bus cards, posters, T-shirts, matchbook covers, and train station platform advertisements. 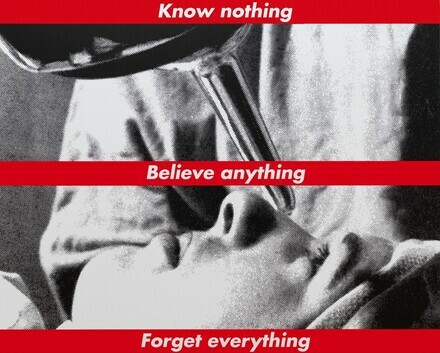 In the above work, Untitled (Know nothing, Believe anything, Forget everything), these admonishing phrases are placed across a photograph of a woman lying down and receiving an unknown medical treatment to her eye through a funnel-like device. Kruger's works often confront the idea of representation, particularly as found in mass media. Have students brainstorm as a class about topics or social issues they are interested in and on which they have a point of view. Discuss relevant concepts like propaganda and media bias. Students can sketch out a few initial ideas to explore in a poster that combines text and art and then work in pairs to give feedback about which idea to pursue. Students will then use their found images, stencils, and construction paper to translate their ideas. Students should write a short artist's statement that explains intent, challenges, and achievements in their works of art. VA:Cn10.1.HSIII Synthesize knowledge of social, cultural, historical, and personal life with art-making approaches to create meaningful works of art or design. VACr3.1.HSII Engage in constructive critique with peers, then reflect on, re-engage, revise, and refine works of art and design in response to personal artistic vision. VA:Re7.1.HSIII Analyze how responses to art develop over time based on knowledge of and experience with art and life. VA:Re7.2.HSII Evaluate the effectiveness of an image or images to influence ideas, feelings, and behaviors of specific audiences.